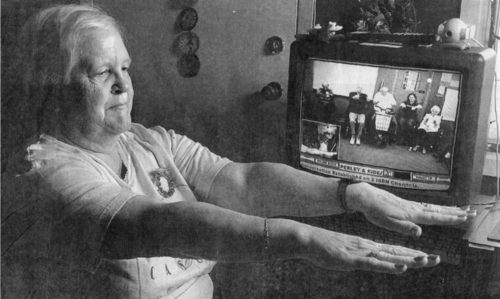 Through tele-medicine, Evelyn Shore of Ottawa can stay at home but still join seniors at the Perley and Rideau Veterans' Health Centre for chair exercises. Technology is helping to bridge the gap between seniors, their community and their health. Physiotherapists at the Perley and Rideau Veterans' Health Centre are using video-conferencing technologies to connect to isolated seniors in their homes for tele-medicine follow-ups after orthopaedic surgery and in physiotherapy coaching sessions and chair exercises. "Isolation leads to increased immobility and mortality," says Dr. Marie-Madeleine Bernard, president of Programs for Autonomy and Communication for the Elderly (PACE 2000), which designed and developed the video-conferencing technologies that link therapists and seniors. "This is all part of the whole strategy to provide seniors with the opportunity to stay active in the community regardless of their handicap." These technologies are also a means to help seniors remain longer in their homes, to monitor patients who are discharged from hospital earlier and to shorten hospital stays. Under the PACE 2000 program, which is still in its pilot stage, residents at the Perley and Rideau Veterans' Health Centre and seniors at home come together Monday mornings for a one-hour workout. Using dumbbells as weights while seated in a chair, seniors work their arms and legs to keep fit and develop and enhance their range of motion. "In terms of rehabilitation, we treat the whole person" says Steve Brown, a physiotherapist with the Family Phyio-therapy Centre who offers the Monday sessions at the Perley and Rideau Veterans' Health Centre in partnership with PACE 2000. "There is an increase in their strength and mobility levels but also the social aspect is important." Evelyn Shore, 70, has been working with PACE 2000 for more than six years and is the host of her own video-conferencing unit. She invites two friends to join in the workouts each Monday. She says the exercise not only increases her mobility and strength but also helps fight off injuries. "I fell off a chair last week and if I wasn't exercising I'm sure the injury and pain would be worse right now," says Mrs. Shore, who also sits on the board of directors for PACE 2000. She says the program also plays a big role in the social aspect of seniors' lives. "Doing this every Monday gives the patients at the Perley and Rideau Veterans' Health Centre a connection to the community that maybe they don't have anymore. They really look forward to seeing us." Currently. it could cost more than $300 a month plus cable connections to install and run the video-conferencing unit in a home that is until it is acknowledged as a form of tele-homecare by the provincial government, says Dr. Bernard. The unit includes a desktop video conferencing system in-corporating a Web-type cam- era, a remote control and a large easy-to-use track bail specially designed for seniors with arthritis. No computer equipment is necessary since the system can be hooked up to a television screen or projected onto a wall or screen, and the font and design of the on-screen interface is especially large for aging eyes. According to the United Nations, (see the address by Dr. Sidorenko, of the UN's International Year of the Older Person, 1999, Web Master's note) older persons are the fastest growing population group in the world, with a steady stream of one million of these persons crossing the 60 year threshold every month, 80 per cent of them in developing countries. Within three decades, one third of the population in many countries will be over 60 and in 150 years one third of the world's population is projected to be over 60. PACE 2000 is trying to address the concerns raised by such an aging population through its vision of an inter-generational residential village where students and seniors will live side-by-side. The community is designed to meet specific housing needs for seniors and to provide affordable housing, education and job opportunities for students. The 180-unit residence is also estimated to generate $2,3 million in savings a year, says Dr. Bernard. The village, which will house 1,640 persons (correction: The village will house 400 persons, Web Master's note) and be equipped with the Video-conferencing suites, is expected to begin marketing units by April 2001, pending rezoning approvals from the City of Ottawa an-en- going obstacle for the non- profit group since 1996. "All we need is the land, about 12 to 15 acres, and then we can self-sustain and save costs," says Dr. Bernard. "Considering the ongoing increase of home care and the aging population, I think it's worth launching it." The same interactive technology Mrs. Shore has been using to connect to her weekly physiotherapy sessions is also being used to connect seniors to,immigrants and youth at area schools. Last year Mrs. Shore connected with students at Almonte District High School once a week, when they would, discuss such issues as abortion; travel, fashion and teenage dating. "I realized that times haven't changed much from when I was dating," says Mrs. Shore. "The experience not only gave me the satisfaction of helping these students, but also gives students a feeling of what their grandparents went through". The video-conferencing program also connects seniors to the Catholic Immigration Centre where they can talk to new arrived immigrants.